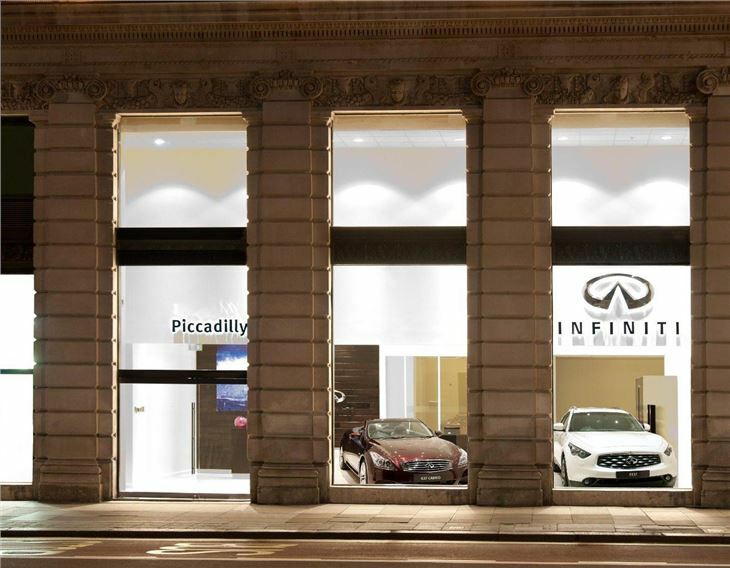 Infiniti, the new Japanese luxury brand that aims to take on BMW, Mercedes-Benz, Audi and Lexus, has opened a new showroom in the heart of London's West End. Infiniti dubs the new outlet a 'boutique' and is the second showroom that the firm has opened, following Reading late last year. Only moments away from some of the city's most famous landmarks and designer stores, the exclusive address of the boutique - 77 Piccadilly - gives car buyers significantly enhanced accessibility to one of the country's newest premium automotive brands and model line-ups, whilst also benefitting from the marque's existing flagship facilities in Reading. The Central London premises will be complemented further next year by two standalone Centres in Chiswick and Hatfield in addition to Leeds and Stockport opening in the North of England. These follow bespoke Birmingham and Glasgow sites that will commence sales later this year. Infiniti claims that its flagship outlet is more more reminiscent of a refined boutique hotel than a typical dealership. 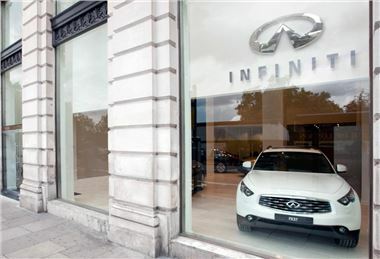 The 203 square-metre three-car showroom is said to have been designed and furnished using the highest quality sustainable materials which reflect the craftsmanship, state-of-the-art technology and ‘inspired performance' philosophy which flow through the Infiniti retail network and model range. Illuminated by an abundance of natural light, individual pieces of art specially commissioned by Infiniti line the vehicle display area, which features the very latest interactive touch screen interface technology, and a dedicated hospitality lounge complete with bespoke leather furniture. Each Infiniti owner is assigned their own Customer Account Manager, a single point of contact throughout the entire ownership of the vehicle. In addition, Infiniti offers free collection and delivery (within a 150-mile radius) for cars due a service, guaranteeing that owners will never feel far from an Infiniti Centre, and further ensuring that minimal inconvenience is incurred. This is supported by a mobility package comprising roadside and touring assistance with specialists on hand, regardless of whether the customer is driving their Infiniti. Every new car also comes with warranties covering the vehicle (60,000 miles or three years), the body (12-year anti-corrosion), and the standard Scratch Shield paint (three years against defects).